Lamborghini Centenario vs Bugatti Chiron vs Jaguar F-TYPE SVR! - Muscle Cars Zone! Over the years we have seen utterly amazing car battles where super fast cars went head to head to determine which one is better but there is no rivalry quite like the Lamborghini vs. Jaguar one. It is guaranteed to offer you great fun and tons of speed, especially when two mighty and expensive such cars go head to head on the streets. These guys are making a video about two absolute monsters in the car world, the Lamborghini Centenario, Bugatti Chiron and Jaguar F-TYPE SVR. Both of the cars leave the garage and are off to some great fun out in the streets. We get a close up look at both of the cars. They look utterly amazing and there is nothing that wrong about them. The Centenario is a little bit louder. So after minutes of cruising along the streets, they hit upon a Jaguar and all of them knew that it was time for the mighty battle, Lamborghini vs. Jaguar F-TYPE SVR. 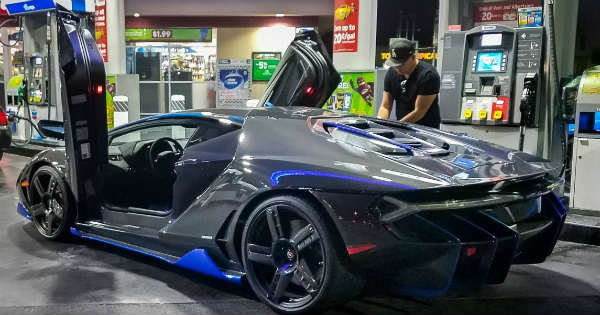 The whooping $2.5 million Lamborghini Centenario did not have any problems and literary trolled the super fast 200 MPH Jaguar. This car simply makes all of the rest look like joke hence it is super powerful and super fast. If you were lucky enough to own this monster, you are one of the only 20 owners of the Centenario hence only 20 such cars were ever made. They continue on having some more fun on the streets and then they are off home.